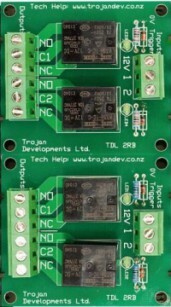 The TDL-1RB is an 8 Amp Relay Board. It has 1 x 12Vdc input that switches a single pole double throw relay. 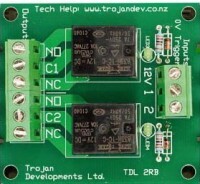 The TDL-2RB is a 2 way 8 Amp Relay Board. It has 2 x 12Vdc inputs that can switch 2 separate single pole double throw relays. 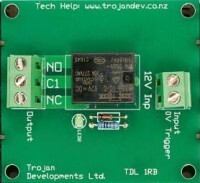 The TDL-4RB is a 4 Way 8 Amp Relay Board. It has 4 x 12Vdc inputs that can switch 4 separate 8 Amp single pole double throw relays. 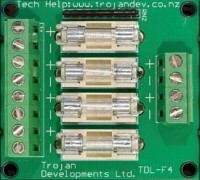 The TDL-4FB is a 4 Way Fuse Board. It has 4 individual fused outputs. Each fuse has an associated LED to indicate that the fuse is operative. The LED illuminates green for normal positive 12Vdc operation and amber for AC voltages up to 24Vac.